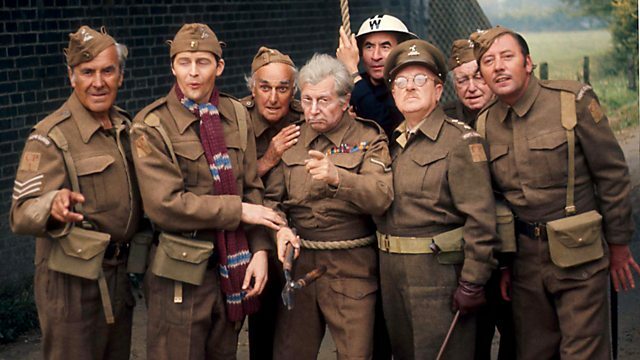 More classic comedy with the Walmington-on-Sea Home Guard. Pike loses his way in a minefield during night manoeuvres and has to be rescued by Wilson. Browse content similar to Sgt - Save My Boy!. Check below for episodes and series from the same categories and more! # If you think we're on the run? # We are the boys who will stop your little game. # We are the boys who will make you think again. # If you think old England's done? We're in the scouts' dressing room because the vicar is holding some function or other in the main hall. broader strategical picture as it now is. -Or, where should Jonesy stick his bayonet? licking the wounds we inflicted at Dunkirk. Still, he is desperate and dangerous. More so, now he's enmeshed with our ally, the Russian bear. -I thought they were communists. -We won't go into that now, Godfrey. -Under stress, we can't pick our bedfellows. -As Crusoe said of Friday. Now, we are standing, shoulder to shoulder here, on the shores of dear old blighty. In the middle, Jack Tar is ruling the waves. -The Bryl... That's enough from you, Walker! -You're late on parade, Pike. There's too much laxity going on. Funny thing to give a lecture on. -Mum made me tidy my room before my tea. -I take a serious view of this absence without leave. Take his name. -Sergeant, did you take his name? -I didn't see you note it. -I told you to take his name down in case you forget it. -Unlikely. I HAVE known him for 19 years. -I suggested you put it down, so you won't forget you've taken it. Is that clear? -He isn't clear to me. To remind me to take Pike's name. -Haven't you the initiative to borrow some? ALL: No, no, no. FRAZER: You wanted empty pockets. Only rank, name and number. -We don't want to show any intelligence. Some of us haven't got too much to show. -Stick it! On the board. -Stick what on the board? What does it matter? I'll tell Mum. She'll fix him. are here, across the Channel. with our Advanced Headquarters here, in the middle, at the Marigold Tea Rooms. Now, we have a serious tactical point. It's on the cards that Adolf has these places very well taped. He's been here for a while, with air reconnaissance, photographs, espionage reports and so on. He could observe our comings and goings. What do we do about that? In the Sudan, we used a little wrinkle. When the fuzzy-wuzzies found our HQ, we had to go to an elsewhere. When they came at us where we wasn't, we fired from where we was. -You've made your point. Thank-you. Doesn't let you finish. Shame. as from tonight, we are, in fact, going to be...here. -A box with a dunce's cap on. No! Harris Orphanage Holiday Home Hut. Quite right, Walker. The Harris Orphans Holiday Home Hut. It has good strategic position. Good observation and an all-round field of fire. -And 3 dozen screaming kids. -No, they were removed after Dunkirk. They wore little blue aprons, and little straw hats and made sand-castles. I wanted to join them. -They had cream buns for tea once. They really tucked in! I'd forgotten about cream buns! Remember they used to fill the buns while you waited? I always licked the sugar off before it went up my nose. -I'm so sorry. Beg your pardon. -Can we get back to tactics? we'll give him everything from here. -All right, as you were. Come on, Godfrey. As you were, at the double. Sit down, as the officer said. -Isn't Sergeant Wilson in charge? -He got a little bit drowsy so I suggested forty winks. But he should be awake and alert! -I know that, Sir, but I... Well, you know, I said I'd waken him when the invasion started. -Give it a rest, Mavis. -I'm so sorry, Sir. I do beg your pardon, Sir. Is anything...wrong? -I gave you an order! Sorry, Sir, would you mind holding that? Terribly difficult to do this without a mirror. Awfully. Is that...nice? -Never mind! You should set an example! You're fast asleep during an alert. Nothing very much was happening so I thought I'd have a little nap. I've had so many disturbed nights what with air raids and things. You must pull yourself together, Wilson. If THEY can stay awake, you must too. Or else stand down for someone who can. -Any sign of them, Frazer? No Christian soul would venture out on a black night like this. It's too dark for a randy tom cat. Even so, keep a sharp look out. Will there be a cup of tea on the way to help clear my eyesight? -Yes. Pike's on the way. -Any chance of a cup of char? -Yes, Pike's on the way. Pay attention a minute, will you? Sergeant Wilson tells me he can't put his hat on without a mirror. I'll give you an invaluable little wrinkle. -Lend me your cap, Wilson. Put it on roughly at first. So. Then take the forefinger, and push it up your nose. Up the outside, of course. with the finger. And align the hat thus, you see? Then put it on one side, as usual, and there you are! So, even without a mirror, there's no excuse for us not looking good. -Arthur! It's SO dark! I'm sure someone followed me! Not everyone finds me unattractive. Frank forgot your biscuits. Where is he? Not here yet. He left BEFORE me, with the flask! -Perhaps the prowler's got him. -Perhaps he IS the prowler. Don't worry. I expect he's lost. He's probably with a lady-follower. -I thought I heard a faint cry. It's from the water's edge! < He-elp! He-elp! -Are you all right, Pike? My leg hurts! I'm caught in the wire! Stupid boy. Why's he out there? ­ I expect he missed the bathers' gap. -Arthur, don't leave him in agony! Go and get him! Would one of you mind... helping me over the wire? I wouldn't try that, Sergeant. Ten paces and you'll be in smithereens. -He's in the minefield! Arthur! -All right. Sergeant, phone the engineer. We need a path cleared. ­ It's a miracle he got there safely. -Permission to give young Pike a few words of encouragement, Sir? Hoi! Pikey! Cheer up, boy! Don't you move a muscle or you'll be blown to Kingdom Come! ­ He must be cold and wet out there. His delicate chest! You don't care enough, Mr Mainwaring! I'm waging war, Mrs Pike... not running a clinic. -we'd be most awfully grateful. Thank-you so much. Goodbye. There's trouble with a landmine. They'll be about three hours. -He can wait. Too bad. He'll learn to be careful next time. He'll drown. The tide's coming in fast. Blimey! The tide covers the wire! Arthur! Save him! He's got all his life before him! All right, but just let me think. For one moment. -While you're thinking, the water's rising. He can't swim! I'll get him! -Keep calm! Pikey boy, your mother's coming! ­ Wait! Why don't we get a boat and we can rescue him by sea? ­ The nearest's at Salthaven. -By the time we rowed back, the boy'd be drowned a whole hour. Oooh, Arthur! -Did anyone see this minefield laid? It made a crazy pattern. Come in and I'll show you. -The orphans collected them. They're pretty. You can hear the sea. The mines were laid in rows of about five. And they were laid about five yards apart in a pattern like that. -There's a clear path through here. If that's wrong, we step on five. Why don't we prod with the bayonet and if we feel one we can detour? -We must cut the wire. -I've got cutters in my shed. -We must start now clearing a path. We'll mark a route for you. -We could use these flags. -The orphans put them on sandcastles. Very gay. I know I don't need to ask for volunteers. Follow me! -Keep as close as you can. -I can't lose you both! Let the others do it. -There are some things one has to do or else one isn't a man, is one? All right, Pike! We're coming! We may have to carry him out, so we'll clear a path for two. Captain Mainwaring, I volunteer to clear a path for two. -Sergeant Wilson and I will lead. -Just coming, Sir. Had to have a little...chat with Mrs Pike. This is no time for that. -Sergeant Wilson and I will lead. You, Corporal, will mark the route. -Godfrey and Frazer in the rear. Godfrey? No(?) Seems crystal clear to me. -First whiff of danger and he's off like a scared weasel. -You've no call to speak like that. -Well, he's not here, is he? Begging my pardon, Sir, Private Godfrey is often missing on account of he has to go hrp-hrp-hrp-hrp. -He has to do what? -He gets taken short, Sir. Right. Give me the torch, Wilson. -I haven't got the torch, Sir. -I told you to bring it. The word 'torch' never passed your lips. -You know you're responsible for it! -Grab a bayonet. I'll take this one. -What are you doing, Corporal? -You touched my bayonet, Sir! -I'm only borrowing it, man! -Years of sleeping in the bush veldt. -Right. Here we go. Good luck. -Make quite sure there's nothing in front of you before you advance. -I do, Sir. I certainly will. Yes, it is all right. -Wilson, there's no need to prod every inch. -They're at least eight inches apart. I know. But one can't be too careful. Right. Come on. Move on. -I think it's all right! If it wasn't all right, we'd know by now. -Thank-you(!) Better mark the route. Can't possibly use that one. We'll have a French one. They're fairly reliable. Who's there? Only me, Mrs P.
Ooh, I thought you were the prowler. Better luck next time! Where are they? Down there I think. -Hurry up! The tide's coming in. -We'll be as quick as we can. Sir, I think... I think I've found something. -Does it feel like a mine? -It's a little difficult to know, Sir. -One hardly likes to overplay one's hand to find out. All right, sir? What is it? What's that? "A Handbook of Field Engineering and Mine Warfare"
Blimey. Halt! Who goes there? Friend or German? How did you get here? Well, the same way as you did. I've brought you a pair of water wings, in case they take a while. But you can't swim! I've got two lots of water wings. And a blanket, in case you were cold. Thanks. Mum hates if I catch a chill. I think I'd better start blowing these up, don't you? Yes. -I expect poor Pikey's getting a bit anxious. -Yes, I expect he is. It's all right, Pikey boy! We're coming! -Please! My nerves won't stand it! -I was only giving him some encouragement. Well don't. Just keep quiet. There? They must be closer, Frazer. It could be a stone, Sir. Wait a minute. Let's clear this. See if we can lift it out. Ooh, wait a minute, Sir! You better be careful, Sir. Some of them have booby trap devices for trapping boobies. Oh, do shut up, Jones. It's metal all right. Not very big. -I've got the clippers. What's up? -If I open my mouth he says shut it. -Of course! It's so confusing! Come on. Let us get past. Let's have a look. Evening, Mrs Pike. Where's Napoleon? Down there, saving my boy. Flashing a light? There's a raid on! -He'll have the Jerries here. PUT THAT LIGHT OUT! -This is a military emergency. -Anything you touch is! Hooligan! Ten to one he blows himself up! Oooh! Your boy'll be fine. Don't worry. -Nearly there, Pike. Stay there. I can't do much else, Uncle, Sergeant. I've got wire stuck in my bum! -Shut up! I'm sick of your voice! -I've never known him like this. -Why? Has he got trouble at home? -Could you cut the bit in my you-know-what first? SNIP Oh! What a relief, Mr Mainwaring! -crawl out after us now? -I'll try, but my ankle's hurting. We need a blanket for dragging him. Would you care for a cup of tea before you start back? -Godfrey! How did you get there? -Through the bathing gap. To keep him company. -You could have been blown up! -Maybe. Sorry, there's no sugar. But I've brought a blanket. You were very foolish, Godfrey. And damned brave. A man of steel, just like I always said. -The water's getting awfully close. -Taffy, you shine the light. Sergeant Wilson and I will drag him out. Spread the weight in case of a deep one. I'll prod in case you've missed one. Right, son, here we go. 1 - 2 - 3 - HEAVE! Oooh! I'll be glad of me Mum's poultice! HEAVE! It was stuck right in... HEAVE! it was rusty and all! HEAVE! -It'd be a pity to die of lock-jaw after all your trouble. -I think I've struck something, Sir. There's something there all right. Stand still. It's very dangerous. He laid the mines. It's all clear 'ere. Yes. All clear 'ere. Em, here. No, no mines here. What a fool you look, poking with your little bayonet! Actually, the mines stop 200 yards up the beach! Yes? Well, in that case, what's this? Cor blimey! It's a mine! You're a right one! -All right, everybody, stay still. -You got me into this! Get me out! Stand still! Nobody move an inch! Well, er...could you lend me your bayonet? MUSIC: "Who Do You Think You Are Kidding, Mr Hitler?"